A quick leaf through the Rules of Golf reminds us that the “Leaf Rule” is golf’s version of Sasquatch. Does it exist? No — with a caveat. Consider that if you hit a ball into deep rough and are confident it’s in a certain area, you still have to find it, correct? Same thing with leaves, and you have five minutes to locate your out-of-sight orb, at least until January 1, 2019, when the latest Rules update takes effect and search time is cut to three minutes. A condensed area of leaves could be considered GUR in some instances. No luck means the dreaded stroke-and-distance penalty … But you want to hear more about that caveat, yes? 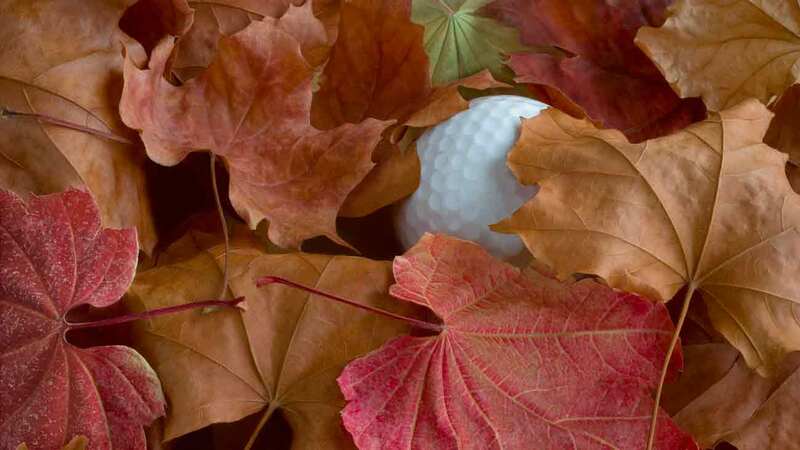 A defined, condensed area of leaves — not the usual array, but rather something caused by, for example, the maintenance crew raking a large pile — could be named by the Committee as ground under repair, even without it being staked as such. In stroke play, if your ball lands in this type of area and you aren’t sure how to proceed, you could play two balls: one using the stroke-and-distance penalty, the other taking free relief from where the ball last entered GUR (i.e., the outer edge of the leaves) — the latter of which is also how you should proceed in match play, assuming you and your opponent can’t agree on the appropriate course of action, and you’re confident you’ll get relief. If your opponent disagrees, he can make a claim to the Committee. Let’s leaf it at that.